Discover an exciting urban lifestyle with the privacy of a single-family home in Residences at Mercato, The Lutgert Companies’ exclusive enclave with easy pedestrian access to the restaurants, shops and amenities of Mercato. Just minutes from Naples’ award-winning beaches and countless cultural offerings, the model homes at Residences at Mercato are open daily. Preview the Le Ciel, Enclave and Le Rivage models and experience the ease of indoor-outdoor living, all privately positioned within cosmopolitan Mercato. The 3,037-square-foot, two-story Le Ciel residence features threebedrooms and four-and-a-half baths. Designed by Rebekah Errett-Pikosky and Charlie Hansen of Clive Daniel Home, the model boasts a new coastal style with a fresh color palette of warm backgrounds. The open floor plan makes it ideal for entertaining. A special feature is a flexible cabana space – with its own en-suite bath – ideal for a home office or guest room. Le Ciel won the 2018 Grand Aurora Award for Single-Family Detached Home in the 3,000 to 3,499 square foot category. 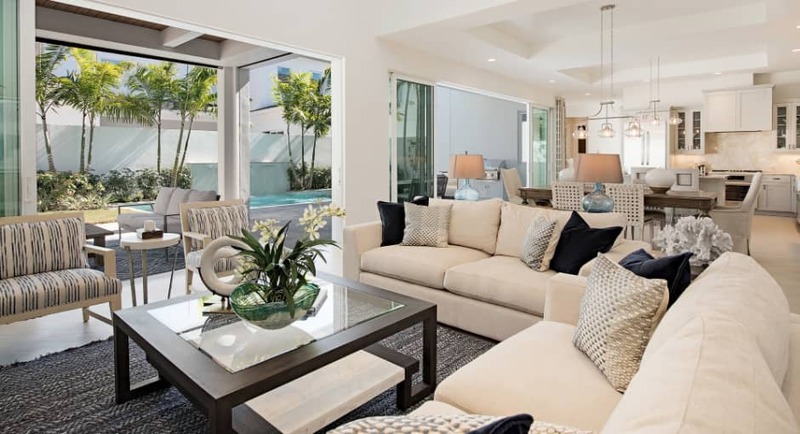 The Enclave is a 2,924-square-foot, three-bedroom-plus-den, three-and-a-half-bath residence with a coastal contemporary vibe. Its two-story great room with natural gas fireplace transitions seamlessly to an expanded outdoor living space. A covered seating area is styled with a second fireplace and integrated retractable rolldown screens. The summer kitchen, alfresco dining space, pool with LED-lit waterfall and spa are accented by stone, silver travertine and white glass tile. With interior design by Jean Losier of Clive Daniel Home, the use of natural wood showcases effortless elegance throughout the residence. The Enclave model was the 2018 Grand Aurora Award winner for Best Single-Family Detached Home in the 2,500 to 2,999 square foot category. In addition to the Le Ciel and Enclave models, prospective buyers can tour the exquisite Le Rivage. This five-bedroom, five-and-ahalf-bath residence is designed with sophisticated finishes of oak, marble and glass throughout its 3,558 square feet of living space. Transitioning from the easy flow of the home’s interior, an inviting outdoor space features a pool with a cascading waterfall fountain and spa. Interior design was created by Charlie Hansen of Clive Daniel Home. Le Rivage received the Collier Building Industry Association 2017 Award for Overall Excellence in Construction and Design in the $2.251 million to $2.5 million category. The residence includes a Clive Daniel Home furnishings package at no additional cost. Low-maintenance living in this gated community of 46 single family homes includes everything from lawn care and pool cleaning to exterior window washing, pressure washing, pest control and painting. Basic cable, internet, water and sewer are also included; natural gas is made available. Situated on 11 acres, Residences at Mercato is accentuated by custom open-air living spaces designed to emphasize year-round outdoor leisure. Winding paver roads, lush landscaping and coastal inspired facades showcase urban living at its finest. This fall, the private enclave will welcome new neighbors as the luxury amenities of Mercato continue to evolve. Saratoga Sundress has recently opened, with Cariloha and Southern Tide scheduled to open soon. Restaurants such as Rocco’s Tacos and Hampton Social, a Chicago-based restaurant by the Parker Restaurant Group, will also debut later this year. Last but not least, exercise enthusiasts will delight in the arrival of Cycle Bar, an indoor premium cycling studio. With the very best shopping, dining and entertainment right outside your door, Residences at Mercato is also just 1.7 miles from the beach. Exclusively marketed and sold by Premier Sotheby’s International Realty, the sought-after community is 70% built out and 65% sold out; only 9 homesites are available for your selection and personalization.